This Mexico City-style pico de gallo made with jicama, oranges, cucumbers, chile, red onion and lime juice is one you’re sure to eat over and over again! When most people think of pico de gallo, they think of a salsa made of tomatoes, diced onion and fresh green chile (such as serrano or jalapeño), lime juice and cilantro. That salsa is also commonly referred to as salsa mexicana. This is not that (although salsa mexicana is good in its own way). However, in parts areas of Mexico if you ask for pico de gallo you’ll end up with a sort of fruit salad-looking thing that you perhaps didn’t intend to order. But make no mistake, this kind of pico de gallo is one you’ll definitely want to try! It’s a favorite snack in our house–great for a lazy afternoon watching fútbol or even for entertaining guests. During one visit to Mexico, my suegra made a big batch of this pico de gallo and it was so good that we ate it all before she got a chance to eat any! The truth was, we thought she had saved some downstairs in another dish and given us only a portion of it, so we gobbled it all up. The only solution? To make another batch, of course! This botana is especially great for the warm weather months because it’s very refreshing. 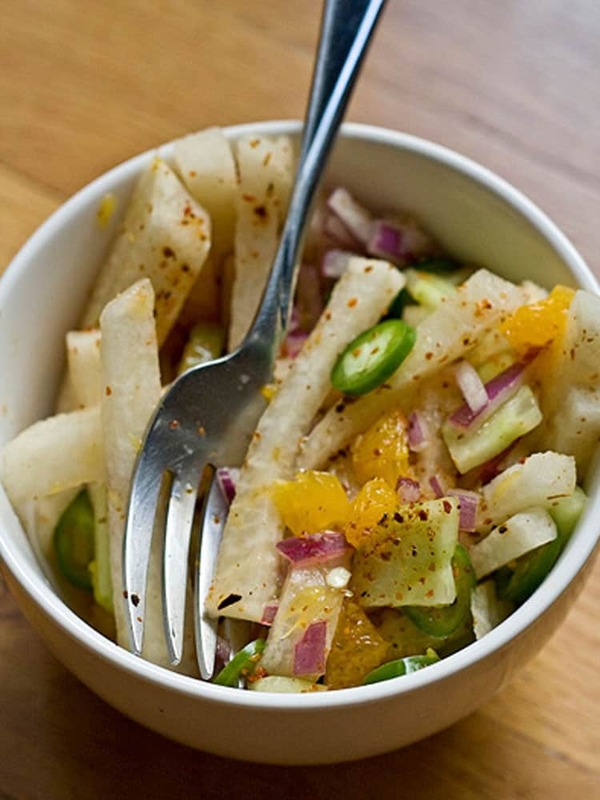 The crisp, crunchy jicama is the base of the recipe, with cucumbers, diced onion, serrano chile and oranges for a unique salad. 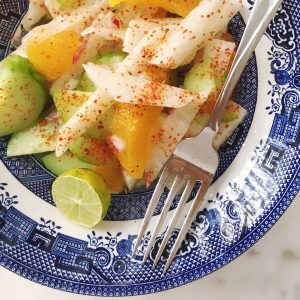 The citrusy dressing is a perfect mix of tart and sweet, with a sprinkle of tajín or dash of salt and chile powder on top to round out the flavor. If you’re unfamiliar with jicama, it’s a legume or root vegetable that’s slightly starchy and has a crisp texture and a very mildly sweet taste. Some people compare jicama to the texture of a crisp apple or a firm pear. They look almost like a brown light-skinned, funny-shaped yam or a big turnip on the outside and the flesh is white on the inside. In English, jicama is sometimes called yam bean root. It’s great alone as a snack or in a salad and is made up of mostly water and is low in calories and very healthy for you. You can store it safely in the refrigerator for about six to eight weeks before it will start to look like it’s getting wrinkly or begins to get sunken spots–a sign that it’s no longer good because over time, the starch converts to sugar and the root breaks down. To cut jicama, just slice it down the middle and into flat sections, and then remove the thin fibrous outer skin. It’s native to Mexico but the Spaniards introduced the species to the Philippines and it’s now popular in Chinese, Vietnamese and other South Asian cooking. Similar to a water chestnut, jicama stays crisp when cooked and easily takes on the flavor of other foods or sauces it’s being cooked with, which makes it ideal for dishes like stir-fry. The rest of the plant shouldn’t be eaten though, as it’s considered to be mildly poisonous. The jicama root itself can range in size from that of a small apple to as big as about six pounds. This pico de gallo can be stored in the refrigerator for a day or two without getting soggy, but is best when eaten immediately. Pico de gallo is naturally gluten-free and vegan-friendly. 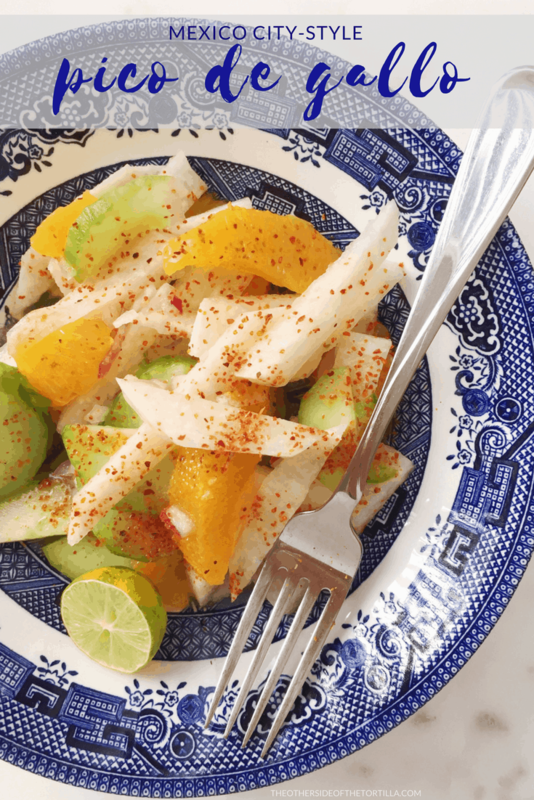 You'll love the different style of this Mexico City pico de gallo made with jicama, oranges, lime juice, red onion, chile, and cucumber. Naturally gluten-free and vegan-friendly, and 100% Mexican! Cut the jicama into carrot stick sized pieces. Slice the cucumber and chile, and dice the onion. Mix them all in a bowl. Juice the limes over the vegetables. Gently juice one whole orange, being careful not to juice all of the flesh. Use a fork or a knife to gently pry some of the flesh out of the orange. For the other half orange, do the same to extract some of the flesh and then squeeze the rest of it for the juice. Add the kosher salt and then toss to mix well. Sprinkle the Tajín over the top and toss well before serving. Pico de gallo can be stored in the refrigerator for a day or two without getting soggy, but is best when eaten immediately. Let me know where you can go for some mean (tasty) cooking classes around town. I am looking to organize some party maybe for my bday in June. Ha.